The former Jammu and Kashmir chief minister alleged that ahead of the 2014 Lok Sabha election, PM Modi had said of getting Jammu and Kashmir rid of the two political families-Muftis and Abdullahs but after the election, he made two members of the Mufti family the chief minister of the state. "You have seen in the last few days how the National Conference, Congress and PDP have exposed their real intentions". Recently, both PDP chief Mehbooba Mufti and NC leaders Farooq Abdullah and Omar Abdullah had said that if the two Articles are abrogated, the state will get "freedom" from India. 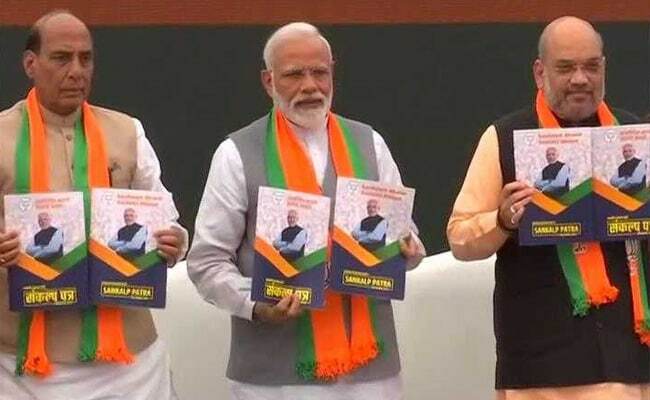 "The Grand Old Party's manifesto promises that AFSPA (Armed Forces Special Powers Act) will be removed from the state if they come to power to demoralise the security forces". The Jammu and Kashmir leader further added in her tweet that "I for once have never lowered political discourse by abusing opponents inc BJP". "The Abdullah family and Mufti family have destroyed the lives of three generations of Jammu and Kashmir. The Congress and their friends were so anxious about their vote bank that they overlooked the atrocities on Kashmiri Pandits", Modi said while addressing the rally. "Some people are so involved in anti-Modi tirade that they have forgotten the security of the country", he said. "They have given a befitting reply to the anti-India and separatist voices as well as to the "Maha-Milawati" gang who have always doubted the people's abilties and willingness to vote for elections in India". The bright future of J&K can be ensured only after their departure.